Alfa Romeo Mito all badged up | What Car? 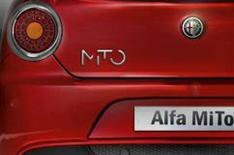 You've seen the car, now here's the badge - this is the image that will adorn Alfa Romeo's Mito when it goes on sale next year. The badge design was chosen by visitors to Alfa Romeo's website, who were given the opportunity to pick from seven different options. The car's original name, Furiosa, was also chosen by public vote, but Alfa Romeo bosses overruled it and chose Mito, which reflects Milan, where the car was designed, and Turin (Torino), where it will be made. The production-ready car is expected to be shown in the metal for the first time at the Paris motor show this October.